BEIJING, Jan. 17 (Xinhua) -- China's top political advisor Wang Yang on Thursday called for enhanced cooperation between China and Russia in economic and social areas. 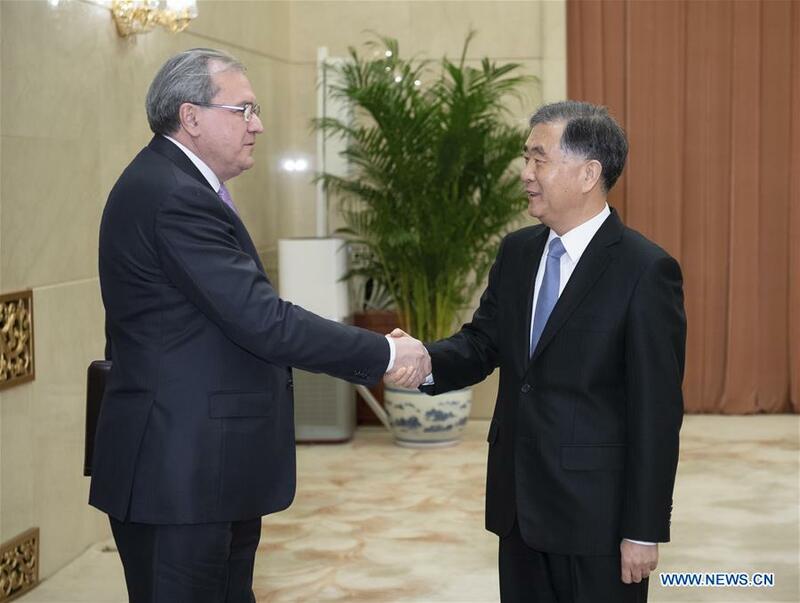 Wang, chairman of the National Committee of the Chinese People's Political Consultative Conference (CPPCC), China's top advisory body, made the remarks while meeting with Valerii Fadeev, chairman of the Russian Public Council. Noting that the year 2019 marks the 70th anniversary of the establishment of diplomatic ties between China and Russia, Wang said the bilateral comprehensive strategic partnership of coordination is at its best period in history under the strategic guidance of leaders of both countries, becoming a ballast stone of regional and international peace and stability. He called on both countries to make concerted efforts to upgrade bilateral cooperation to a new high, to benefit the two peoples. The CPPCC National Committee will continue to support cooperation between the China Economic and Social Council and the Russian Public Council to deepen bilateral exchanges in the economic and social areas, and promote overall advancement of relations between the two countries, Wang said. Fadeev said the Russian Public Council stands ready to continue to work for the mutual understanding and friendship between Russia and China.